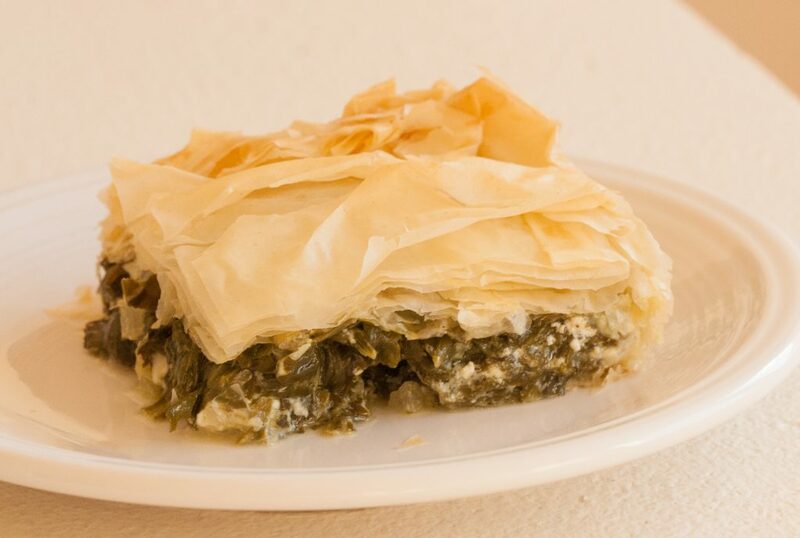 If you’ve ever eaten in a Greek diner, you may have eaten spanikopita, a traditional spinach pie made with flakey phyllo dough. But unless you have a yia yia (Greek grandmother) you may not have tasted hortopita: wild greens pie. Wild edibles are part of everyday life in Greece, in fact, you’ll often find wild edibles for sale at village markets. Hortopita is classic, Greek peasant food: hearty, satisfying, and suitable as a side dish or a main course. While my yia yia made her own phyllo dough, it’s perfectly acceptable to buy phyllo. Most American supermarkets carry it in the freezer case. If you can find country style phyllo, use that for this dish. It’s slightly thicker and I like it for savory pies. Thinner phyllo is better for baklava and other, delicate sweets. Don’t be intimidated by the idea of working with phyllo. It’s not hard once you get the hang of it. Because the dough is so thin, it dries out quickly, and once it’s dry, it breaks easily. To avoid this, take a clean dish towel and soak it thoroughly. Squeeze out the excess water, then drape it over the unrolled phyllo. The moisture in the towel will keep the dough pliable. Extra water left in the towel will turn the dough to mush, so be sure to squeeze it out well. Please note: This recipe is for an 11 x 17 baking pan. You may adjust the quantities to make a larger or smaller batch, but be sure to cut the phyllo to fit the size of your pan. Heat a few tablespoons of olive oil in a large pan and cook the onions or scallions until they are tender and translucent. Add the greens and cook to reduce, then remove them from the heat and let them cool. Once the greens are at room temperature, add the bee balm, feta, yogurt, and eggs, and combine thoroughly. Start by adding a teaspoon of salt and 1/2 teaspoon of pepper, then taste and adjust as needed. Set the greens mixture aside. Open the plastic wrap surrounding your phyllo and unroll the dough. Spread your phyllo out on the counter and cut through the layers to make it fit the bottom of your baking pan. Now, cover the phyllo with a damp dishtowel, as described above. Spray the bottom of the pan with olive oil spray and lay down a piece of phyllo. (You could use olive oil applied with a brush instead of spray oil, but with spray you’ll be less likely to tear the dough.) Spray the phyllo with olive oil and lay another piece on top of the first. If you’re using country style phyllo, you’ll use two sheets per layer. If you’re using thinner phyllo, you’ll need four sheets per layer. Don’t forget, keep the dough covered with the damp dish towel while you’re assembling the pie. Take half of the greens mixture and spread it evenly across the bottom layers of phyllo. Place a layer of phyllo on top of the greens and spray it. Add another layer of phyllo (if you are using country style) or three layers (if you are using the thin phyllo), spraying each layer. Spread the remainder of the greens on top of the phyllo, and again, add two or four layers of dough, spraying each layer with oil. Using a sharp knife, score the top layer (or two) of the phyllo into rectangles. If you wait until after you’ve cooked the pita, the dough may crack when cut. Scoring the raw phyllo makes for neater cutting later on. Bake for 45 minutes or until the top layer of phyllo is golden brown and crispy. Remove from the oven and let it cool slightly, then cut and serve. What a yummy dish this hortopita was! I’m so thankful I learned from you ! I made this since the class I had with you. I used dandelion, perselane, chickweed and lambs quarters. Whoaaaa! Yummy ! Thank you for posting the recipe! Everyone needs to make this before the snow covers our wild greens ! Katie! That’s so great! I’m really glad you tried the recipe at home and that you liked it. You were such a great group. I don’t remember the plant that was highly sought after that day we foraged for the greens. Remember? It’s the one that the frost killed and we didn’t get as much as we had hoped. It has little white flowers . Hi Katie, That was Gallinsoga parviflora. It’s a mild green, and since it has small hairs on the leaves, it’s texture is better cooked than raw, I think. Bet you’ll find a lot of it next summer.